I always like to watch these awards shows, though it's hard to say why. On a good year, I've seen perhaps 5% of the material being nominated. This year I think it was down to about 2%. (I've seen "Lost," and Kung Fu Hustle, and...uh...well, anyway...) In fact, this year had a higher-than-average number of shows and movies I've never even heard of. But if they sounded interesting, I added them to my Netflix queue. Hollywood folk, in general, act like high schoolers, don't they? Which is no slur on high schoolers, who are at least acting their own age. But when you expect smirking, popular Clooney over there to start shooting spitwads at the camera, you begin to wonder what happened to the elegance. I guess Anthony Hopkins is fairly elegant. Though I had no idea he ever played Hitler. Or that Jonathan Rhys Meyers played Elvis Presley. Or that Kenneth Branagh played FDR. I am intrigued by all these facts. I think I was confusing Match Point with one of those ditzy tennis-star romantic comedies that came out recently. (Wasn't there one starring Kirsten Dunst or something?) Perhaps Match Point has more substance. I'm wary of Woody Allen's tag on it, but from the clips it looked very unlike Woody's usual whiny stuff. OMG, Gwyneth's dress looked like randomly crumpled tissue paper. Joaquin Phoenix has graduated from "sulky" and now perhaps embodies the word "brooding" for our time. "I'm very happy to have won. Honest. I almost smiled." I would say the same of Jonathan Rhys Meyers for his non-smiling acceptance speech, but he looked more scared than brooding. Loverly Irish accent on 'im, though. I definitely want to see Capote. It's very rare that a book you read five or more years ago lingers clearly in your head, but In Cold Blood certainly did. Most of the presenters kind of sucked at doing their job, which is sad considering they're professional actors. 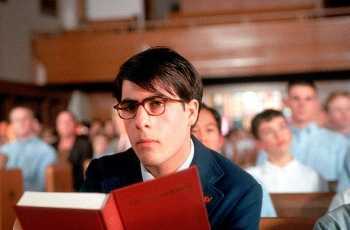 However, that Brandon Routh, a.k.a. "The new Superman" (about whom I reported a very rude and salacious rumor), really is quite dishy. Fairly close resemblance to Christopher Reeve...with just a touch of Jason Schwartzman, when he puts on the Clark Kent glasses. The sister and I started watching at the beginning of the night but quickly got bored and put in "Galaxy Quest" instead. The Thermians have better crowd control than the Golden Globes. Seriously, what was with all the people having no idea which way to exit the stage and looking like deers in the headlights up there. I am sorry that I missed Joaquin, but I did see both Laurie and Carrell make their acceptance speeches, and it sounds like that was the highlight of the evening, so I'm probably better off having skipped most of it. Hehe...yes, we also commented on how amusing it is when award winners start wandering off stage the wrong way, and get stopped and turned around by the supermodels who direct traffic up there. Funniest acceptance speech has to go to our darling Hugh Laurie, though Steve Carell gets an honorable mention. Poor Rhys-Meyers - he will never get used to Hollywood. He had a chance to become a star after Velvet Goldmine, but chose not to - what a good boy! Oh, my goodness. Thank you so much. Thank you to the Hollywood Foreign Press Association for this. This is absolutely terrific. The people I must thank of course are Paul Atanasy, whose original concept the show House was. Brian Singer, whose rampant hypochondria has informed the entire thing. Katie Jacobs, whose wit and tastes has stamped itself in every frame of every show. And finally the incomparable David Shore, who is one of the finest, (Applause) yes, who is one of the finest writers it has been my privilege to say the lines of. I could have done with him in the middle of that sentence. I would like to thank obviously my fellow cast members and wonderful crew. All the other terrific writers. My good friend, Stephen Fry sitting over there. And finally, most importantly, my wife, Jo, who has come all this way. My three children Charlie, Bill, Rebecca. They’re sitting at home. In which case I say to them: Go to bed! Thank you so much everybody. Thank you. My three children Charlie, Bill, Rebecca. They’re sitting at home. In which case I say to them: Go to bed!